Following the success of its Competency Based Education Bachelor of Business Administration degree program—which was unveiled this fall with a Management and Leadership concentration and allows adult learners to earn their college degree in a few years for under $10,000—the University of Maine at Presque Isle is adding two new CBE offerings this spring and has plans to bring another one on board in Fall 2018. UMPI will offer both Accounting and Project Management concentrations within the CBE BBA degree program starting January 2018 and has plans to provide a new History degree within the CBE modality in Fall 2018. 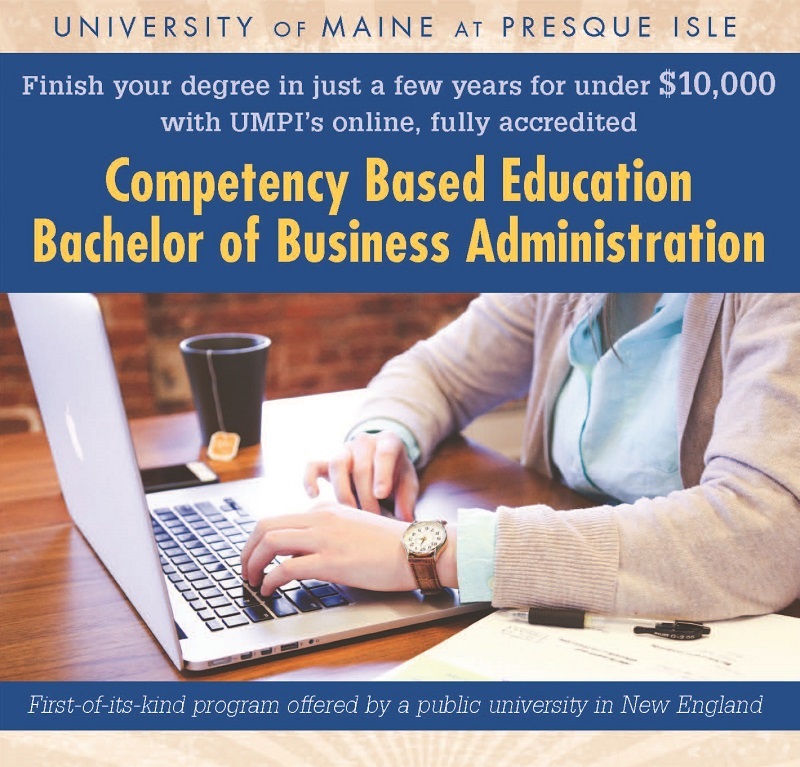 UMPI is the first bricks and mortar public university in New England, and one of a small number across the country, to offer fully-accredited CBE degree programs like this. UMPI’s CBE offerings allow in- and out-of-state participants to complete coursework at their own pace with all-you-can-complete online competency modules. They can also save money by getting college credit for past learning and work experience while taking advantage of a flat-tuition rate that is less than half the cost of standard, full-time tuition. These degree completion programs were created specifically to meet the needs of the estimated 200,000 adults in Maine with some college but no degree and provide them with an opportunity to finish their degree on a schedule that fits their lives, with online programming and expert support that can be accessed from anywhere. In general, CBE degree programs—most of which are offered by online institutions—apply participants’ prior learning and past work experience as college credit; involve a list of competencies (instead of courses) that need to be completed; use a digital platform that provides learning modules for each competency, allowing participants to progress as they demonstrate their mastery of academic content; and let students complete as many competencies as they like during a set time period—buffet style—at a subscription rate. A competency is defined as an individual capability, proficiency, skill, behavior, value or body of knowledge. When a student begins work on a particular competency, they will take a pre-assessment to determine which areas they already understand, and then the platform will automatically tailor their learning to the knowledge and skill areas they need to develop further in order to demonstrate mastery. With UMPI’s CBE degree programs, participants will be able to apply past college credit, other learning, and work experience toward their degree. After determining which competencies they still need to complete, an UMPI learning coach will create individual learning plans. Students will then be able to pay a flat tuition rate of $2,000 per semester—less than one-half of UMPI’s standard in-state tuition rate and one-third the standard out-of-state rate—and be able to take advantage of as many competency learning modules per term as they’d like. Additionally, all materials and resources needed are embedded in the digital platform so there are no textbook costs or fees. The program is Financial Aid eligible; students may also qualify for the University of Maine System’s Adult Degree Completion Scholarship. Participants should be 24 or older, have the equivalent of a high school diploma, and some prior college credit and work experience. For all of these CBE offerings, students will have contact weekly with their learning coach to guide them through the learning process, and, upon graduation, they’ll receive a transcript that outlines the specific skills, knowledge, and abilities they’ve acquired by completing their competencies. For more information about the Accounting and Project Management concentrations that will be offered starting Jan. 2018, or to sign up, fill out the inquiry form here or contact Carolyn Dorsey at 207-768-9584 or carolyn.dorsey@maine.edu.